In response to an earlier post, Kim left a comment asking when I planted my Sweet Peas here at the Ranch, and if it's too late to plant Sweet Peas now (at the end of February). Kim, good morning. I planted my Sweet Peas in 1999, but not to worry: you still have time (but just barely). 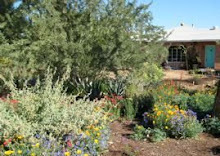 One of the great gardening surprises of the Desert Garden is that this most beloved of cottage-garden flowers will thrive here, and not only thrive, but given the chance will re-seed and come back year after year. I planted Sweet Peas here at the Ranch in the Autumn of 1999, and they've come back every year since, wandering around the landscape and sprouting wherever they find a congenial patch of soil and sufficient water. We plant Sweet Peas in the same season we plant the edible, or English, garden pea: late September through the end of February. Peas, both Sweet and English, are cool-season plants, meaning they germinate and start their growth in the Autumn, Winter, and early Spring. Depending on the weather in a given year, either end of that planting season may be lengthened or shortened; if you still want to try Sweet Peas for this year, plant now, or forever hold your peas (OK, not forever, but at least until early October). The growing and blooming season is short, so look for short-season and early-blooming varieties to plant. There's no need for the elaborate digging and trenching regimes of traditional Sweet Pea planting; just dig in a good amount of compost or other organic matter, plant your peas, and provide the little guys something to climb on. There's a chance that this late in the season they will fail to germinate, but don't worry about that: the seeds will just hang out in the soil all Summer and then start growing in the more comfortable Autumn weather. Whenever your Sweet Peas sprout and flower, the keys to keeping the blossom going for a long period are to not let them wilt from lack of water, and to pick the blooms daily. Snip them with scissors, leaving a long stem, and place the blossoms in a small vase indoors. Or, better yet, pick small bouquets and give them to your neighbors. As soon as the flowers begin setting seed in the garden, the plant will begin to stop blooming. That's why I've had volunteer Sweet Peas here at the Ranch for 10 years; at a certain point each season the flowers just get beyond me and I let them go to seed. The pods ripen and explode, flinging seed around the garden, and settling in to grow again in the Fall. It's a bit chaotic, but all chaos should smell so sweet. Also, lime-blossom time, lemon-blossom time, peach, apricot, plum, rose, petunia, sweet pea, Senna, penstemon, and a whole lot of other blossom time. This morning, standing in the middle of the rear yard here at the Ranch, the landscape was literally buzzing with the activity of honey bees and hummingbirds. For sheer floral display, scent, and hyper-frenetic activity, no Mardi Gras celebration can hold a candle to Shrove Tuesday in the Desert Garden. No bead-throwing, but the honey bees are scattering citrus blossoms everywhere. This is the first of the year's major nectar flows, and all the bees and hummingbirds take advantage of the bounty. It is also the most important part of the year for the gardener cultivating tree fruits. Most of our citrus trees, and all of our deciduous fruit trees – apple, plum, apricot, peach – bloom only once a year. The blossoms pollinated right now become the fruits we harvest in the coming months; no pollination, no fruit. That gives us each a special responsibility at this time of year: don't spray anything bad in your yard. If you normally use systemic insecticides on your roses, fast-acting weed-killers in your yard, bug spray around your home, weed and feed in your turf, or anything similar, now is the time to take a break. At this time of year, anything you spray anywhere will end up in the bees and the butterflies and the hummingbirds fluttering around your landscape. In the past few years, bee populations in the United States have been devastated by unknown causes; the scientists are still figuring out why, but while they work on it, we can each do our part and decide not to poison the bees in our own little neck of the woods. And even if you don't have fruit trees, one of your neighbors does, so do it for their sake. We'll make a deal: you give up spraying for Lent, and I'll let you eat all the chocolate you want. It's been a very good year for cauliflower here in this corner of the Desert Garden. Back in early Autumn, a friend and neighbor stopped by with six cauliflower plants she'd been given, and we popped them in the ground just to see what might happen. On such happenstance are great adventures often borne. Two of the plants are of a Romanesco type (lime green with fractal outcroppings), two are an orange cauliflower, and the last two are purple (pictured above). One of the purple ones was the first to go, becoming lunch yesterday. After harvest it weighed in at a good pound-and-a-half, which is hefty for a cauliflower. The purple coloration of this variety comes from the presence of anthocyanins, a water-soluble flavonoid that colors everything from sweet violets to blackberries and beech trees; the word "anthocyanin" comes from the Greek, meaning "flower-blue." In my book, the whole point of purple cauliflower is the purple; given that the purple pigment is water soluble, it seemed best to find a cooking method that would keep as much of the color as possible: soup, of course. Cream of cauliflower soup is easy to make. As it turns out, purple cauliflower makes a cream soup that tastes much like vichyssoise, and is colored the exact shade of blueberry yogurt. Cauliflower is a Winter-garden vegetable, as are all the cruciferous (cabbage family) vegetables. Plant it in the Fall in rich, but not over-fertilized soil, and be certain to water in the winter dry spells. I have found that a generous amount of good compost, dug into the soil before planting, makes subsequent fertilizer unnecessary. The only significant pests are cabbage looper caterpillars, which occur in small numbers, so are easy to pick off. Harvest cauliflower when the heads are well-sized, and just before the individual florets begin to separate; cauliflower quickly becomes coarse once it passes its peak. The variety pictured above is called "Graffiti" and retains its color when cooked. There is another variety called "Violet Queen" which is also bright purple, but fades to light green after cooking. Either is good on the crudite platter, but if you have your heart set on purple soup, go for the Graffiti. Anthocyanins are pH-sensitive, so while I didn't try this myself, I suspect that adding a couple of tablespoons of lemon juice to your soup stock would preserve more of the purple color. The picture to the left is of some Mexican Lime blossoms at night. The Mexican Lime tree here at the Ranch is fairly laden with flower buds; it's usually an early bloomer, and this year is no exception. On the one hand, it's a welcome sight: harbingers of Spring and all that. On the other hand, it's not such good news: contrary to what we might think, it's still Winter here in the Desert Garden, and our harbingers are harbinging a little too early (there's no such word as "harbinging." I made it up. If you use it you have to smile a little bit while saying it so people will know you know better.). While it varies by area, it's not unusual for the last frost in desert regions to arrive as late as the middle or end of February. As I write, the temperature is dropping in this corner of the Desert Garden, and we expect to have a freeze tonight. I mentioned in my earlier post on frost hardiness that the Mexican Lime is the most frost-sensitive of the commonly grown citrus. That's a shame, because it's one of those fruits that is much better grown at home than purchased in the market. The small green limes in the grocery, often called "bartender limes," are unripe Mexican Limes. They're small, predominantly acid in flavor, and sometimes a bit dry. A ripe, home-grown, Mexican Lime is yellow, full of juice, and has a rich and complex flavor; it is as different from its mass-market counterpart as a home-grown tomato is. If you plant a Mexican Lime tree, choose your most-protected Winter location; that will likely be an area close to the house. Here at the Ranch, the Mexican Lime is on the North side of the house, planted very near a patio overhang. This has the double advantage of being both cool and warm. Being on the North, the area stays cooler than the surrounding landscape, so the tree isn't encouraged to break growth early with warm weather. Being near the covered patio, the tree derives some frost protection from the warm air trapped under the roof. Buy your Mexican Lime tree from a local nursery to get the most adapted rootstock, and plant it in the Spring, after the last frost, but early enough that it has a chance to establish before Summer hits. As with all citrus, water deeply but infrequently, and fertilize gently; multiple small applications are better than one heavy application. You can begin using the limes any time after they've grown large enough and have some juice in them, but for fully ripe and best-flavored fruit, wait until the limes have turned yellow and fall from the tree, then collect them from the ground. I had an e-mail some years ago from a man who wanted to know why he wasn't getting any fruit from his Mexican Lime. Every year, he wrote, just when the limes were about ripe, they would fall off the tree and he'd pick them up and throw them away. Year after year after year. Don't let this happen to you: with any other citrus, a fallen fruit is a bad sign, but the Mexican Limes are supposed to fall off when they're ripe. I'll let you know how the buds hold up to tonight's freeze; this may turn out to be a year without limes. On a more cheerful note: tomorrow I'm posting a picture of purple soup. Actually, it's pretty easy, but it does make a mess of things. The address for this blog, TheDesertGarden.com, has been registered with GoDaddy; in light of their recent Super Bowl ads, I had to question whether I wanted to continue to do business with them. The issue was decided for me after recent media comments from GoDaddy's CEO that pretty much amounted to a big middle-finger to any customers who might think the ads were in poor taste. It's likely that the transfer to a new registrar will mess up access to the blog for a few days, so don't be surprised if it briefly disappears; no worries, we'll be back.